14.212.550 Building Disposition and Configuration. A. 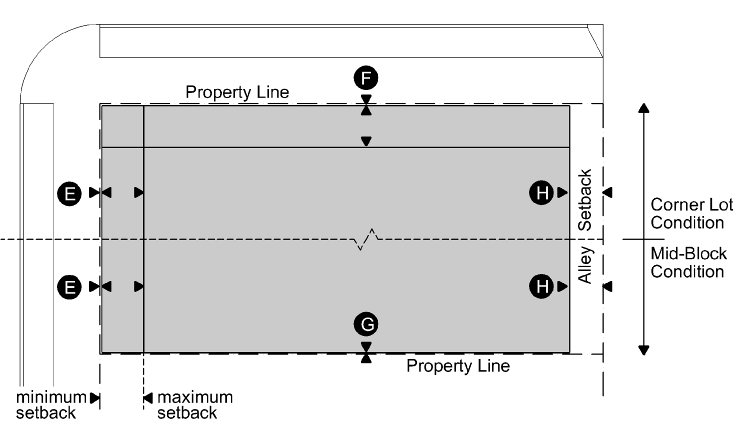 Buildings shall be oriented to adjacent streets according to Tables V-1 through V-6. 1. 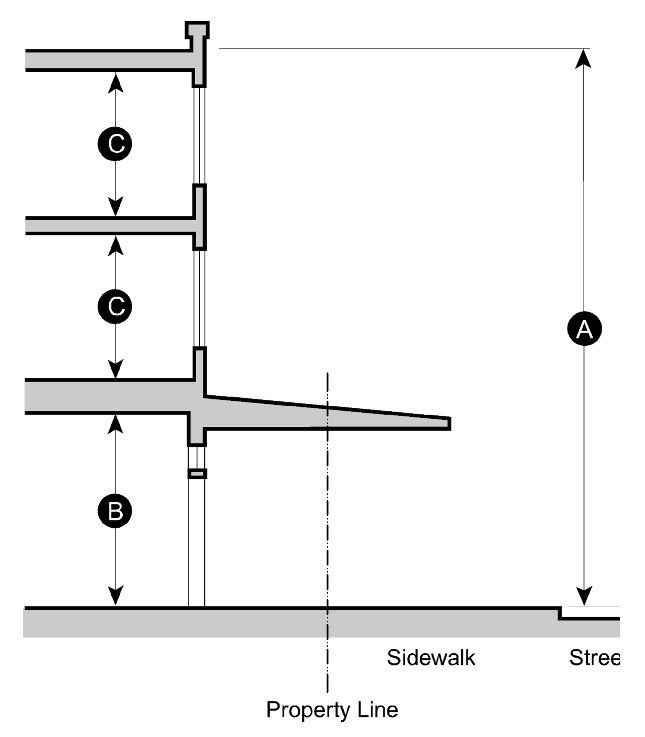 Where required, façades and primary entrances shall be parallel to and visible from the adjacent street or its tangent except as allowed under sections 2 and 3 below. 2. Primary entrances may face street corners where corner entry private frontages are permitted. 3. A primary entrance accessed through a Forecourt private frontage is not required to face a public street provided that it is visible from the public street. B. Buildings on corner lots shall have a principal frontage and a secondary frontage. The principal frontage shall be consistent with the site address and the location of primary pedestrian site access. Lot configuration shall be based on the principal frontage. 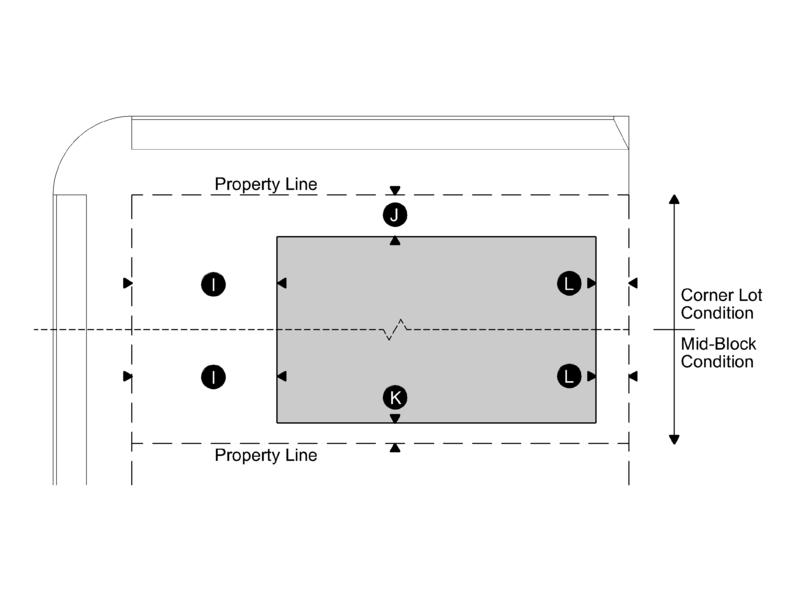 C. Where a building façade does not extend along any portion of a frontage line in the Neighborhood Center zone, an architectural wall between 3.5 and 4.5 feet in height shall extend from the façade along the remainder of the street frontage. The wall shall be architecturally consistent with the principal building and shall have horizontal openings no larger than necessary to allow vehicle and/or pedestrian access. 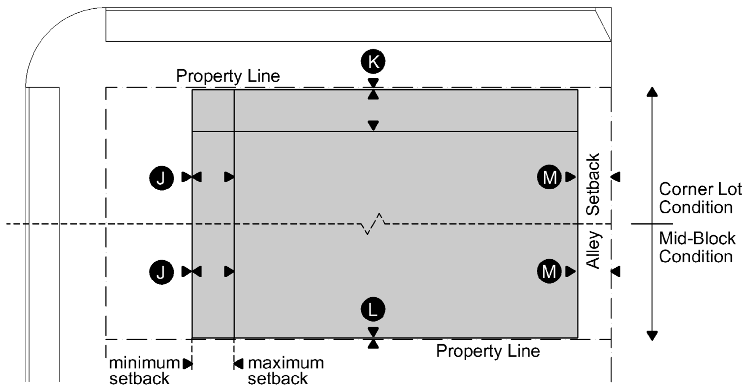 D. Setbacks for principal buildings and outbuildings shall be as shown in Tables V-1 through V-6. Setbacks may be adjusted according to SMC 14.212.140. 1. 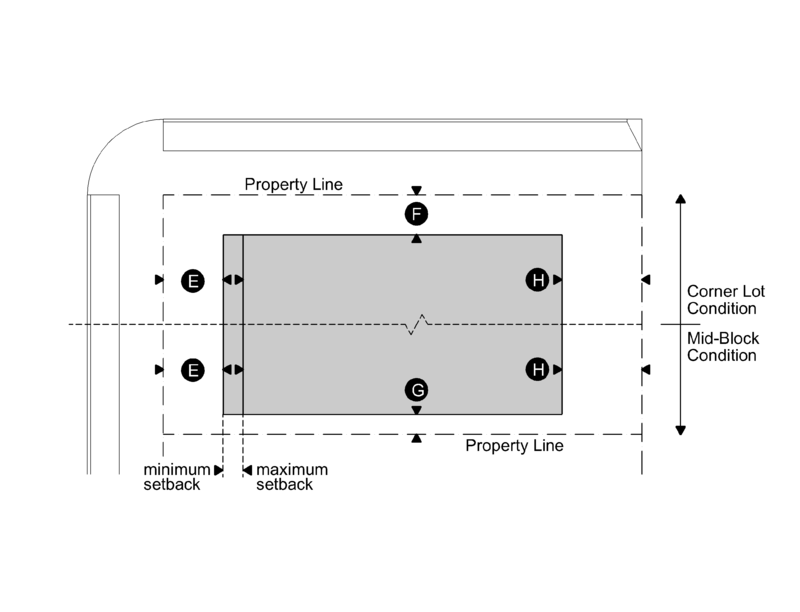 Bay windows and open porches with no enclosed floor area may encroach into the front setback up to 50 percent the setback depth. E. One principal building at the frontage and one outbuilding to the rear of the principal building may be built on each lot. 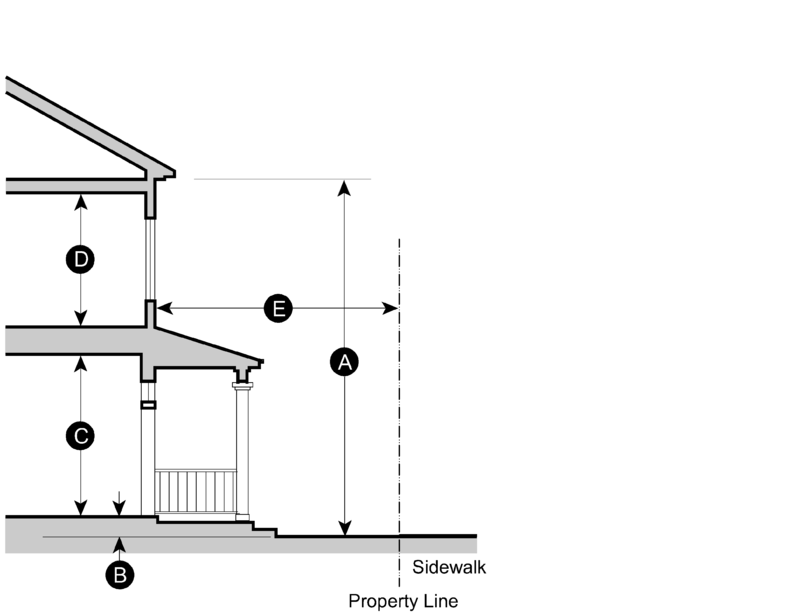 Only one single-family dwelling is permitted on one lot except pursuant to the bungalow court exception in SMC 14.212.500. 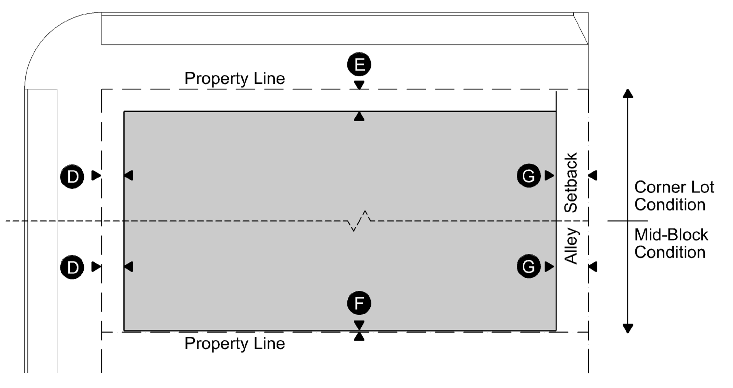 F. The private frontages for each zone shall conform to the standards in Tables V-1 through V-6. G. Awnings and canopies may encroach into the public frontage within two feet of the curb. 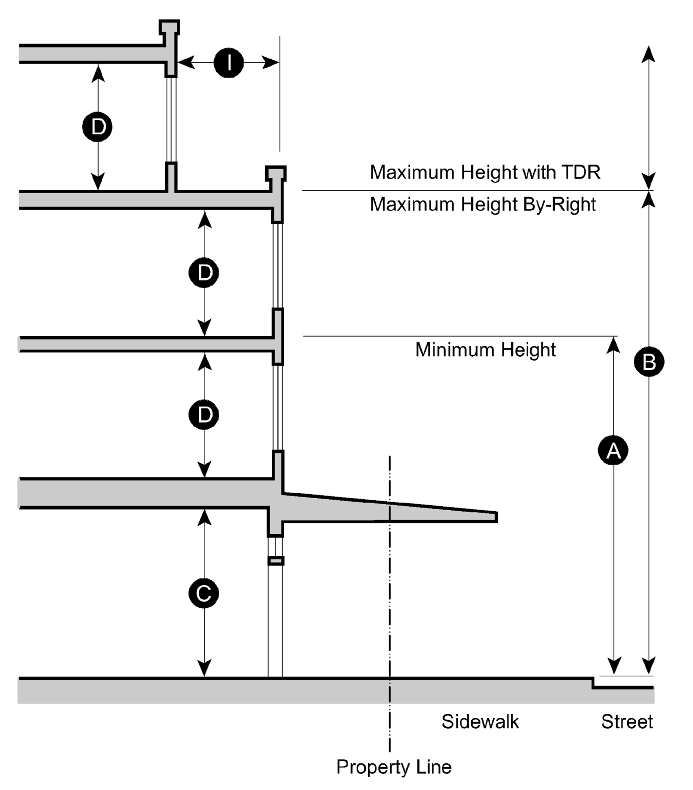 Where a canopy encroaches into the public frontage, the lowest portion of the canopy shall be eight feet above the sidewalk. Note: if blade signs are anticipated, awnings and canopies should be designed to allow an eight-foot clearance between the bottom of the sign and the sidewalk. H. Loading docks and service areas shall be permitted on private frontages only by approval of a deviation pursuant to SMC 14.212.170. For buildings with a commercial floor area of 25,000 square feet or greater, loading spaces shall be provided that fully contain delivery vehicles on the site and outside any alley, street, or sidewalk. Buildings less than 25,000 square feet of commercial floor area are not required to provide a loading space. 20 ft min. plus principal building setback. Townhouse – 40 ft. min. 20 ft min. plus building setback. 1 story and 20 ft.